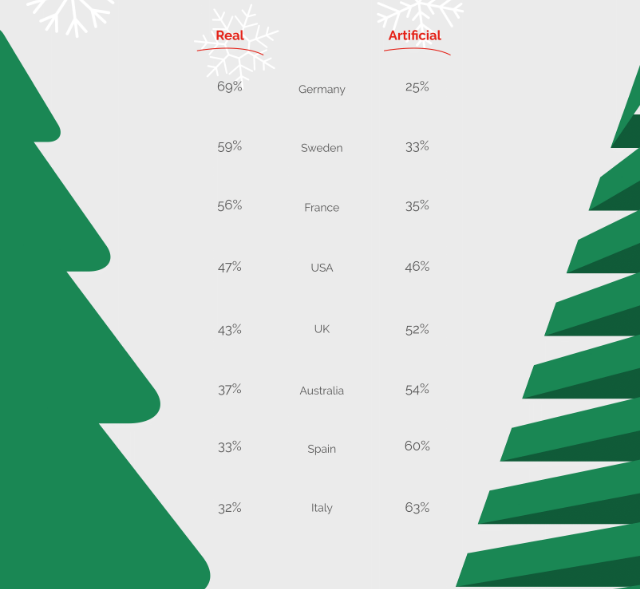 A new international study by research firm YouGov has probed people around the globe’s reaction to Christmas with some rather surprising results. 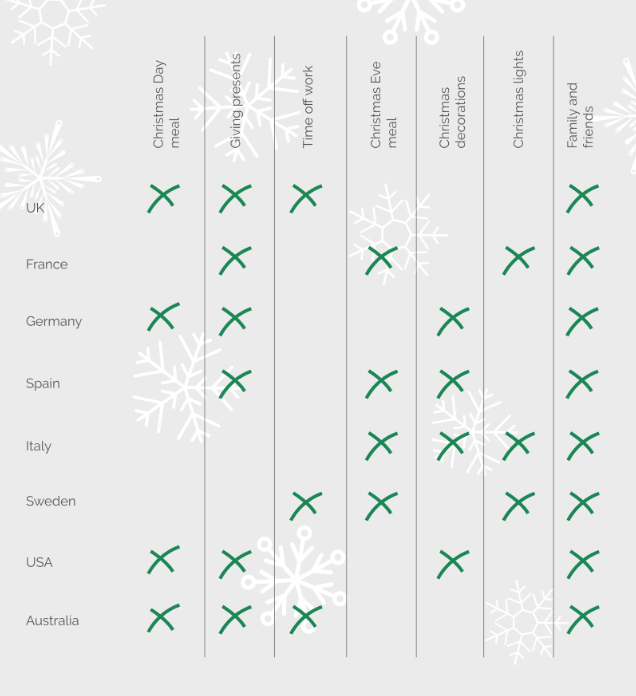 The study asked people throughout Europe (France, Germany, Italy, Spain, Sweden, and the UK), plus the US and Australia, about their attitudes towards Christmas, including what they look forward to most and how they feel about the season in general. When it came to we Aussies, a very high proportion (74 per cent) said it had become too materialistic. Some 24 per cent of us said we dreaded the day (57 per cent agreed they looked forward to it). Some 30 per cent of us don’t put up a tree. And the best part about Christmas? Aussies liked the over-eating and the time of work, apparently! All the nations surveyed said they enjoyed spending time with family and friends at Christmas. However, Australia didn’t rate a mention for enjoying “the Christmas eve meal” or “Christmas decorations”. 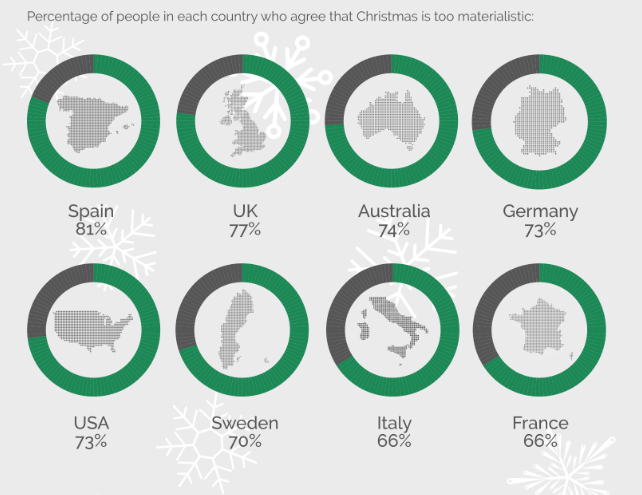 Interestingly, Australia ranked third when it came to the over commercialisation of Christmas. The Spanish were most likely to agree with the sentiment (81 per cent) and the French least likely to agree (66 per cent). The Germans are the ones to get most excited about the festive season according to the study with 68 per cent agreeing they look forward to it. The Spanish and the French are the least excited with only 42 per cent from both countries saying they looked forward to it. Equally, those two nations were also the most likely to dread the whole thing. 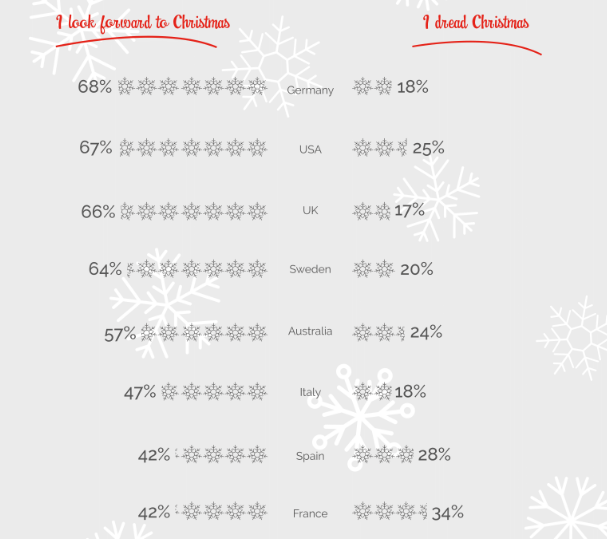 Some 34 per cent of French respondents and 28 per cent of Spanish said they hated Santa’s pending arrival. The Germans were most likely to put up a real tree at 47 per cent, while 70 per cent of Italians erected an artificial one. The Swedes were the biggest Christmas scrooges with 35 per cent agreeing they couldn’t be bothered putting anything up at all. 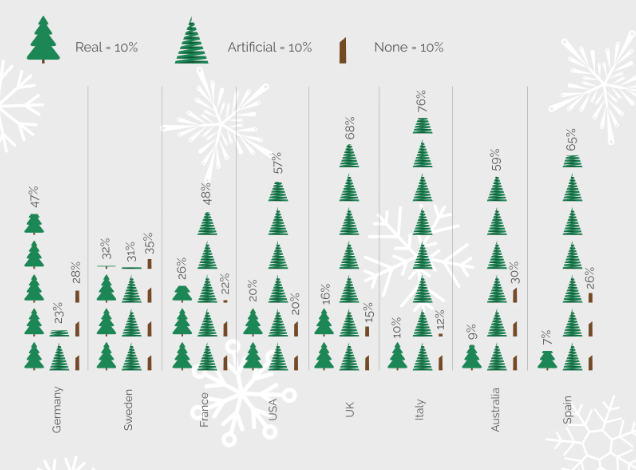 Again, the Germans were the biggest fans of taking an axe and chopping down a tree with 69 per cent agreeing they preferred a real Christmas tree. Only 37 per cent of Aussies wanted the real thing and 54 per cent preferred the good, old plastic artificial variety. We have no idea what the other nine per cent thought.